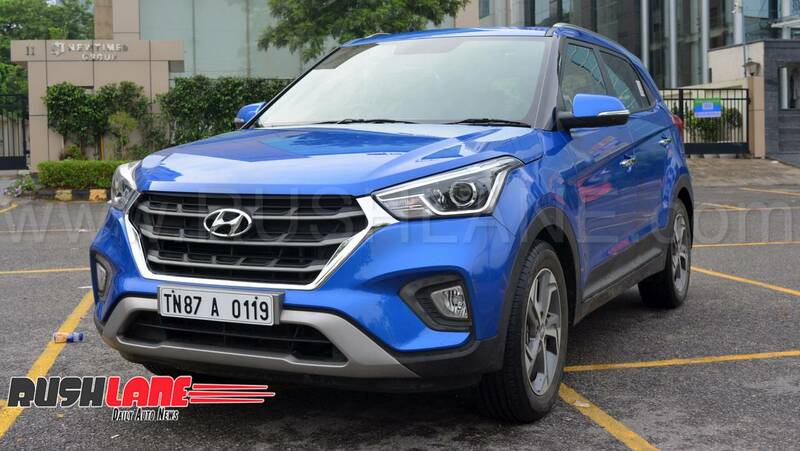 2018 Hyundai Creta Review – Still the Perfect SUV? We drive the 2018 Hyundai Creta and here are our first impressions. Hyundai’s R&D team would have met with a challenge when they launched the Creta back in 2015. The challenge of improving a vehicle which was already being marketed as ‘The Perfect SUV’ and went on to bag the Indian Car of the Year award as well. The SUV didn’t just bring in accolades and awards, it brought in consistent 7-10k sales numbers as well. There is a reason why there are over 4.2 lakh Cretas on Indian roads already! Hyundai had 3 years to work upon the vehicle and let’s find out what new have they brought to the table! Exteriors – Hyundai has retained the overall styling of the 2015 Creta in the 2018 version. There are almost no changes to the sheet-metal but numerous other body parts receive an updated design. The first most noticeable change is the larger front grille which sits at the front. It brings in the same design language which most of the new Hyundai vehicles from across the globe have started to follow. The headlight units have been re-profiled and the DRLs have now moved near the fog lamp units at the bottom. Move to the side and you instantly notice the new 17 inch diamond cut alloy wheels which look absolutely stunning. There is some change to the cladding as well which is easy to miss. Rear is where there isn’t much of an action. In fact, it might even be difficult to distinguish the pre-facelift and the current model from each other. If you look closely, you get to notice that there is a new grey coloured skid plate at the bottom and the tail lamps have been redesigned. Other additions to the SUV include the inclusion of two new colour options Marina Blue (in pictures) and Passion Orange. Also you can opt in for a dual-colour scheme as well, which is available in orange-black and white-black combinations. Interiors – Step-in and the wide & roomy cabin of the Creta welcomes you. 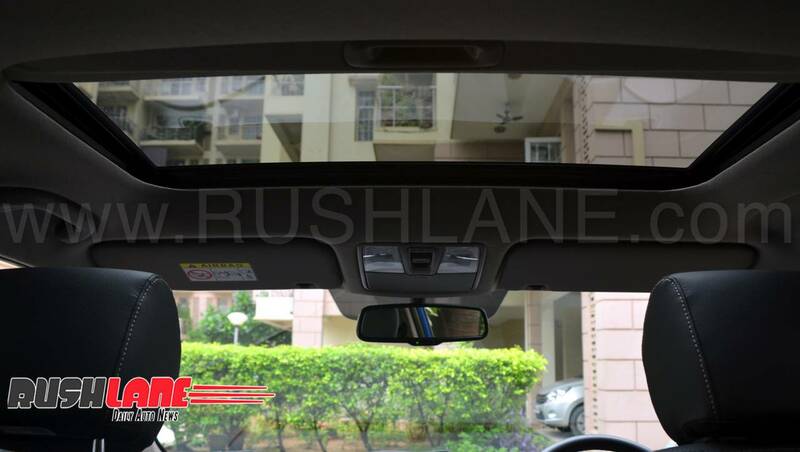 One of the key noticeable change which will catch your eye is the addition of the electric sunroof, which adds up to the premium quotient of the vehicle. Additionally, now Hyundai provides cruise-control, electrically adjustable driver seat and a wire-less charging bin, among other new features. However, in case, just like us, if you don’t have a phone which supports wire-less charging, you can still use the USB power socket to charge your smartphone. The boot is very spacious and there is no sill, so you get to use the boot to its full potential without any hindrance. 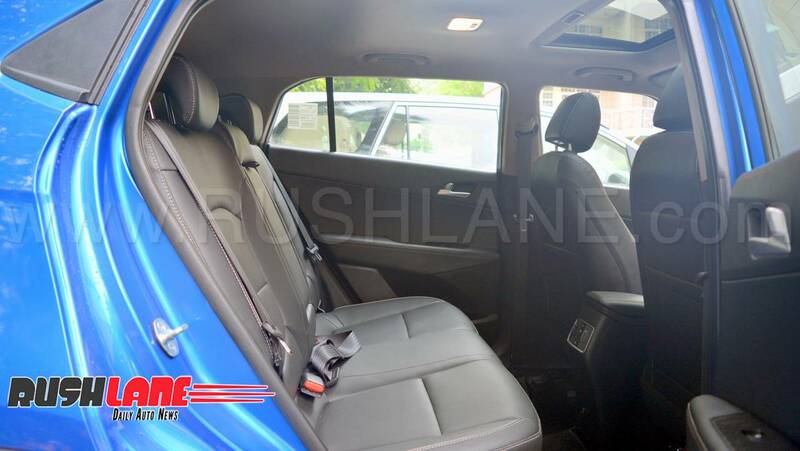 As before, all the seats are really comfortable and there is ample amount of knee room and head room for the rear passengers. The floor is flat which means that the middle passenger will also have a comfortable journey. 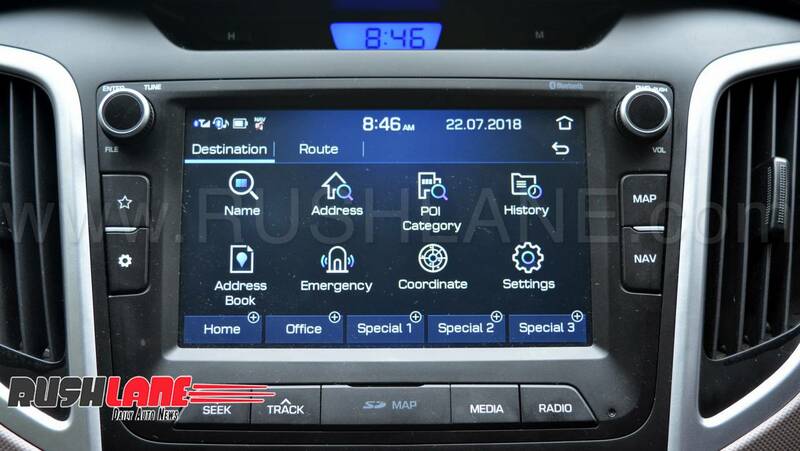 The infotainment system has also been updated and comes with all the latest features which you would expect like Apple CarPlay, Android Auto and has pre-installed navigation. It also supports Hyundai’s Mirrorlink application which can provide you more details regarding your driving pattern. The overall interface is fluid and the touch is very responsive. Special mention to the ARKAMYS sound system which provides a really good in-cabin audio experience. Hyundai has also added a smart key band which doubles up as a fitness tracker. You can use it to unlock the car and then turn the engine on and while you are not with your car, you can still put it on and use it as your watch, calorie counter, fitness counter etc. when you pair it up with your mobile phone. The new electro-chromic auto-dimming rear view mirror proves to be a real blessing during night drives on Indian roads, which are flooded with drivers who are obsessed with the high-beam of their cars, for reasons which we can’t fathom. And yes, now you get your personal Swach Can from Hyundai which is basically a small portable bin where you may store used wrappers/covers etc and throw them later in a dustbin. It might come in handy, especially after the Virat-Anushka incident, just saying! Keep your city clean folks! Driving Dynamics – Driving the 1.6 litre diesel Creta is a lovely experience. The motor is peppy and supports you with its long power-band which starts early around 1800 RPM and goes all the way up to 4500 RPM. Though you don’t need to shift the gears that often but just in case you do, the 6-speed gearbox supports you with every shift which is slick, convenient and precise. The clutch is on the lighter side and it won’t tire you at all, even during a full day drive. Hyundai mentions that it has tuned the motor to improve the fuel economy by 4%, however we couldn’t identify much of a difference. In our drive of around 550 km which included a mix of city roads and highways, we managed to get a fuel economy of 17.3 km to a litre, which is respectable for a SUV of this size. Ride, Handling & Braking – The overall ride quality of the 2018 Creta is on the softer side and no we aren’t criticizing. The car has some body-role, because of its SUVish design however Hyundai has managed to contain it well under the acceptable limits. 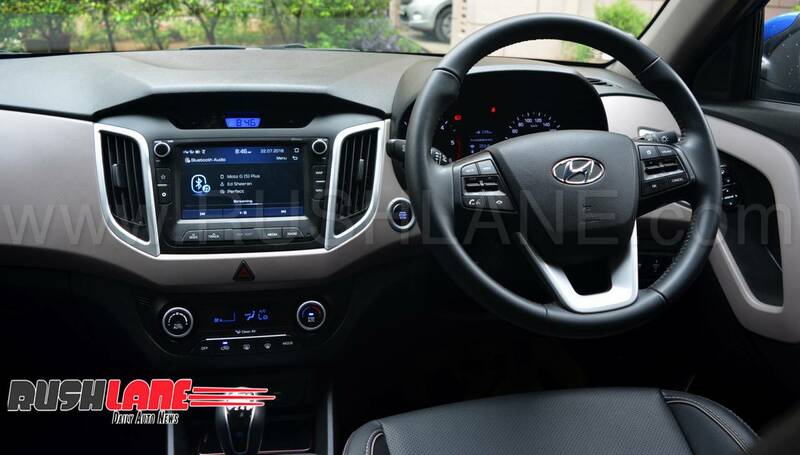 The light steering helps you to manoeuvre the SUV in city roads however the steering weighs up appropriately when the car starts to hover around triple digit speeds. This has to be one of the most apt steering setup from Hyundai, ever. NVH was never an issue with the Creta and Hyundai seems to have taken the refinement to the next level by practically insulating the cabin from all tire, road and wind noise. The engine too is silent during low RPMs though it becomes vocal post the 3000 RPM mark however the engine note is pleasant and would sound like music to your ears, in case you are a petrolhead (dieselhead, in this case). Brakes provide a good bite and there was nothing to complain about them, even during incessant rains. Parking the SUV is not a challenge either as the light steering and the reverse parking camera with dynamic guidelines support you to ensure that parking is as easy as parking a small hatchback. Variant Rejig – The Creta is available in 3 engine options, 1.4 litre diesel, 1.6 litre petrol and 1.6 litre diesel. All 3 engines are available with a 6 speed manual gearbox however the automatic option is only available on the 1.6 litre diesel variant. Sadly, the top-end trim – SX(O) is available only on the manual versions of the 1.6 petrol & diesel engines and not on the automatic versions. The dual color options are also available only on the same manual grades and not on any other variant. Overall, there are 13 variant options, 5 petrol manual, 1 petrol automatic, 2 on the 1.4 litre diesel (both manual), 3 on the 1.6 litre diesel manual and 2 on the 1.6 litre diesel automatic. Verdict – We will agree that there are certain aspects which Hyundai could have had worked upon, for example, they could have easily brought in ventilated seats and it would have become a segment-first feature, just the way it did in the new Verna which is ironically priced way lower than the Creta. Automatic wipers and automatic headlights, both are not available even on the top end variants, which can cost upto INR 18 lakh and this is certainly a disappointment. Hyundai has also tried to keep costs in check by small cost-cutting measures. 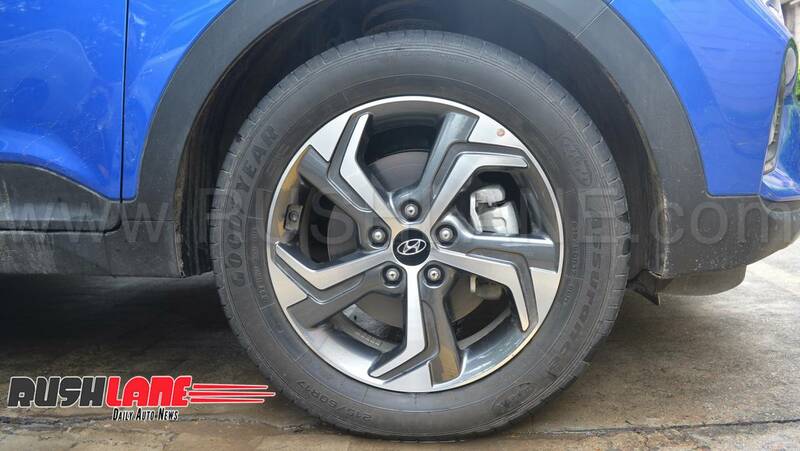 For example, the spare wheel is not an alloy, the key-less entry request button features just on the front right door and not on the left, however, none of these majorly hinder with the overall performance of the vehicle. To sum it up, if you are looking for a vehicle in the INR 13-18 lakh range and sedans aren’t your type of cars, then, the Creta stands out as one of the best option. The vehicle is very practical, has a commanding presence on road, is easy to manoeuvre, provides numerous creature-comfort features, really looks appealing in its current form and provides a good value for money quotient. In our opinion, the 2018 Creta is still the Perfect SUV for the urban jungle.